Mangaluru, Oct 21, 2017: Karnataka Bank, unveiled its revamped website on Oct 19, Thursday at bank’s headquarters in Mangaluru. The revamped website is designed with a theme of simplicity and clarity keeping in view the ever-changing aspirations of new generation customers. It provides an aesthetic look & feel and ensures smooth & hassle free user experience. “Website is the face of any organisation in online world as it is an imperative platform to establish its credibility and to showcase products and services as prospective customers, investors and business associates visit the website to know more about the Bank. 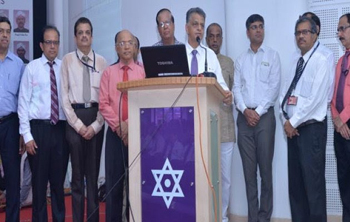 Karnataka Bank, in its pursuit of aligning with the latest technology & meet the aspirations of Gen Y customers, has redesigned its website www.karnatakabank.com with user friendly interface & modern outlook, advanced and enhanced features & functionalities. I am extremely happy to launch the new website, which is simple, quick and efficient,” said Mahabaleshwar M S, Managing Director, CEO of the Karnataka bank after the launch of the new website. Dr. Ravichandran, CEO of Diya Systems, P R Karanth, General Secretary, AIKBEA and other executives, general managers of the bank were present on the occasion.